Over the past couple of months the kite fishing has been pretty bad compared to the same time last year. All this changed on one day in December. I have mentioned previously about the the top ten snapper ladder the pub and fishing club run. It started again on the 1st of December. At the end of each month we have a prize giving. The sea has been flat and blue for almost three weeks and every day between 20 and 40 boats go over the Mokau Bar mainly to target snapper. Some return with their limits, all around 6-8kg fish, which are common down here. Meanwhile I am sitting on the beach with the kite out hoping the fish will start coming in close. All I have been catching lately is gurnard and all I wanted was a snapper. On December 30th a light offshore breeze came up around 6am so I raced down with the gear and frozen squid. The kite got out to about 300 metres and stuck on a sand bar. The wind was not strong enough to get the gear past the bar. The sea was calm enough to row my dinghy so I went out and rowed the sand bottle out past the sand bar. Two hours later, as I was pulling the gear in, I saw a flash of a big snapper tail in the waves. I pulled it into knee height and waded out to get the big fish. Just as I was getting near it the fish got off the hook. Luckily it was worn out and I managed to get a hand through it's gills before it disappeared in the waves. 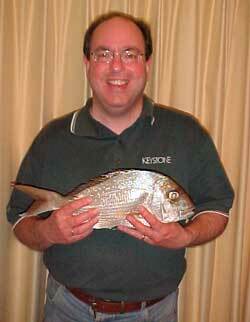 It was a fat, healthy fish weighing just under 10.4kg. I also caught a smaller snapper on the same set. My fish held onto the lead for the last day of the month to win the prize for the heaviest fish for the month. Once again I have beaten all the boat fishermen to the monthly prize. Some of the guys wonder how I do it. We have boats down here worth a lot of money with all the high tech fishfinders, GPS etc. It's January 8th now and I haven't caught any snapper this month for January's competition but it's early days yet. Two 9.0kg snapper have been weighed in already. I decided to try fishing at Orewa Beach on December 21st. This was my second visit to Orewa. On arrival at 7pm I found several longline fishermen at the northern end of the beach, so I decided to set up at the southern end this time. The wind was southwesterly at approx. 15 knots - ideal conditions for kite fishing! Since I was fishing on my own this time I used my large Pocket Sled Rig with my boat rod set up with 20kg line. I encountered 3 surfboarders, but there were no other obstacles and my sand dropper rig with 4 Target hooks fitted was a breeze to operate - much easier than trying to operate the beach reel on my Flexiwing Rig single-handed. I caught nothing on the first two sets, but the fact that my salted mullet bait returned to me without being eaten by the paddle crabs gave me confidence to continue fishing, even though it was almost dark. At 9pm I was rewarded with a 1.3kg snapper caught about 700 metres out. The landing was witnessed by some of the locals who were most impressed that such a fish could be caught with the aid of a kite! Next time I am hoping for bigger ones, but it was a good start and a great evening on the beach. Hawkes Bay kitefishing has been very productive and catches of huge gurnard on longlines and dropper rigs are being reported daily. There are plenty of crayfish around the rocks, so when you have finished kite fishing for the day there is an opportunity to grab yourself a cray or two before heading for home. The moki have just started coming in close to the beach, and as moki between 10 and 15 kg are common off Porangahau you should try targeting them. 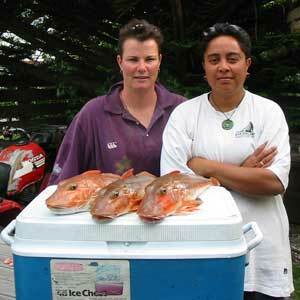 The locals use crab, crayfish or shellfish to target blue moki. It looks as though the snapper are six to eight weeks late in this area so, although they are patchy at the moment, it shouldn't be long before they are in close. Above : Trev Sciascia caught this gemfish off Blackhead Point, northern end of Porangahau Beach. Above: Bernadette Pothan and Katie with a couple of beauties from Porangahau. 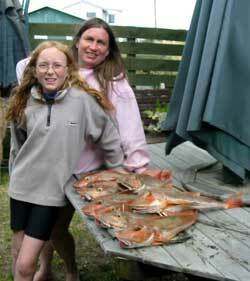 Right : Robyn & Helen Edwards with a nice haul of gurnard from Porangahau beach. If you are the Porangahau Beach area call in, have a chat. If you have been fishing record you catch and have your photo taken. Hi, I called at your shop not long ago. I am staying at Whatuwhiwhi on the Karikari Peninsula. We went fishing at 90 Mile Beach in the far north on December 30th. Decided to fish the Ahipara end of the beach. The wind was a bit fickle and dying but managed to get out once with the Flexiwing Kite and small Skyhook. I baited the 10 hooks with kahawai and left the rig out for 30 minutes. Caught a good gurnard, a pan sized snapper and a beautiful snapper weighing 8.6kg. Went back next day - sharks everywhere. I have a photo available. It is the biggest fish taken from beach for a while according to locals. Ed: Please send the photo, can't wait to see it. I purchased some of the floating beads from you at the Tauranga Boat Show to use on my motorised kontiki. I had five of them spread over a 25 hook set and caught four snapper and one gurnard. Thought you would be interested to know that all the snapper were caught on the floating bead traces and salted mackerel bait. The baby octopus baits were left untouched. On a longline rig system do you weight both ends of the hook section? Ed: For a kite longline, any motorised longline or kontiki, weights are only required on the seaward end, ie. at the end of the hook section on the outside end. Dropper Rigs need a weight at both ends, depending on the conditions on the day. Weights at both ends are definitely required for boat longlines. Commercial fishers weight their longlines about every 30 hooks with a 0.5 to 1.0kg weight. 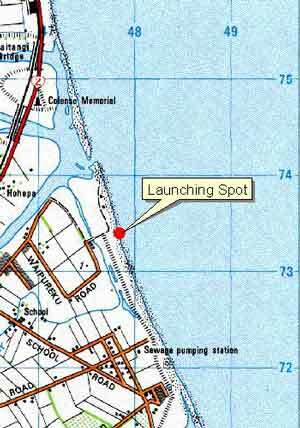 I towed the Boat Longline out by kayak about 200 metres past the end of Leisure Island and 100 metres to the right of Leisure Island at the end of December. I baited the 25 hooks with squid and dropped the hooks at 7.10pm. For a bit of fun I paddled back towing a fly but had no hits on the way in. We pulled the set in about 8.15pm with five small (350mm+) snapper. We tried again the following night, same situation but nothing. Two days later we did the same set right on high tide and caught two snapper just over legal size. We trolled about five times with three different lures for kahawai, with no luck. All good fun though. On Saturday the 14th of December I and my two sons went to East Clive, Hawkes Bay for a kite fish (see attached map for location). A strong offshore NNW wind was blowing, and quite a bit of tack was needed so we used both the Super Kite and large Skyhook. Baited up with a mixture of salted blue mullet and baby squid onto 25 new Target Hooks. The line went out well. On retrieval problems started and it became obvious that the line was caught up in a large object on the bottom of the sea floor. It took about three hours to get the line in and most of the traces came back with the hooks missing. We tried moving the reel up the beach both ways but it wouldn't budge. I had to use a tow rope between the reel and 4 wheel drive, and tried driving up beach when the line became too tight to haul. Eventually the line broke where it joined onto the kiteline, and we watched the two kites disappear over the horizon. Both kites have contact details marked on them including "New Zealand" which seemed a very useful addition to the address as they went quickly out of sight over the horizon. Not a good days fishing and that is why I have included the map for others reference. I haven't had a lot of luck lately, sharks galore. The good news is I have been advised this week that the sharks seem to have gone from the west coast out of Dargaville. 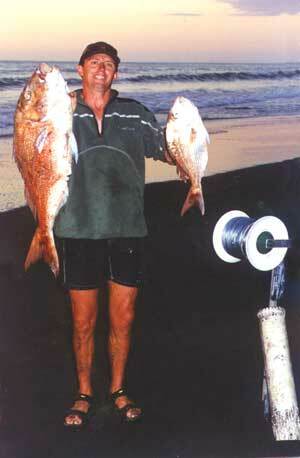 Colin Sherman told me he landed a whopping 12kg snapper recently from Glinks Gully. I put my Bottom Longline Rig out last week and caught three snapper, a large gurnard and a shark. I thought I would give it a go as it was far too wet to do any hay making. David Billings and Jamie went over to Glinks Gully a couple of weeks ago and got busted off by what they suspect were sharks as they did land half a kahawai plus a shark. I am told the trawlers are often seen at this time of the year so people should keep a good lookout for boats when fishing the west coast. Also beware of long trips down beach at Glinks, as coming back at high water in soft sand can be really interesting. I almost got stuck in 4WD, 2nd low, it was really struggling to pull through but got home in the end. Paul's Fishing Kites are offering a $30.00 gift voucher for the best photo of the month that makes it into the kitefishing report in the NZ Fishing News magazine or onto our website. The prize is available for photos of catches taken on one of our kitefishing rigs or with our Target Hooks. There is no limit on entries so you can send in as many pics as you like. The photo is an excellent shot and was taken at Rarawa Beach, while the Kite Fishing Club were holidaying in the far north. A $30.00 voucher will be out to you very soon. This photo was taken by John Pothan at Porangahau Beach, well done John. Send in your pics and be in to win the $30.00 voucher for this months draw. You could be our lucky winner.